It’s hard to make health messages easy to understand. (Can we get an amen, dear readers?) But can you guess what’s even more difficult? Getting people to remember and act on our messages. 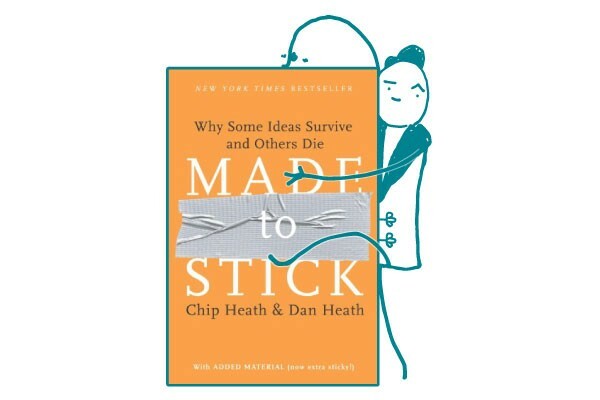 In this edition of the We ❤ Health Literacy Book Club, we introduce a book with a method that can transform the way you communicate ideas: Chip Heath and Dan Heath’s Made to Stick. You can find sticky ideas in all sorts of places — from stellar advertising campaigns to urban legends to great speeches. And, according to the Heath brothers, the reason these ideas stick with you is no great mystery. There are 6 distinct traits (or principles, as the Heath brothers call them) of sticky ideas — and it’s pretty easy to put them to work. For example, resist the urge to say all-the-things. Instead, prioritize and find the core idea. (Sound familiar?) That’s the Simple principle. Here’s another one: Humans are hard-wired to expect patterns. So when you break a pattern, you get people’s attention. This means that in order to keep your audience’s interest, you have to make them want to know more by creating “curiosity gaps.” That’s the Unexpected principle. Made to Stick is a breeze to read, but — true to its name — it sticks with you. The Heath brothers share stories that illustrate what sticky successes (and non-sticky failures) look like. They walk you through before and after examples to demonstrate how to repackage messages. And they describe the nuances of each principle, explaining which kind of appeals work best in different situations. The bottom line: Change behaviors by getting your health messages to stick with the 6 principles in Made to Stick.